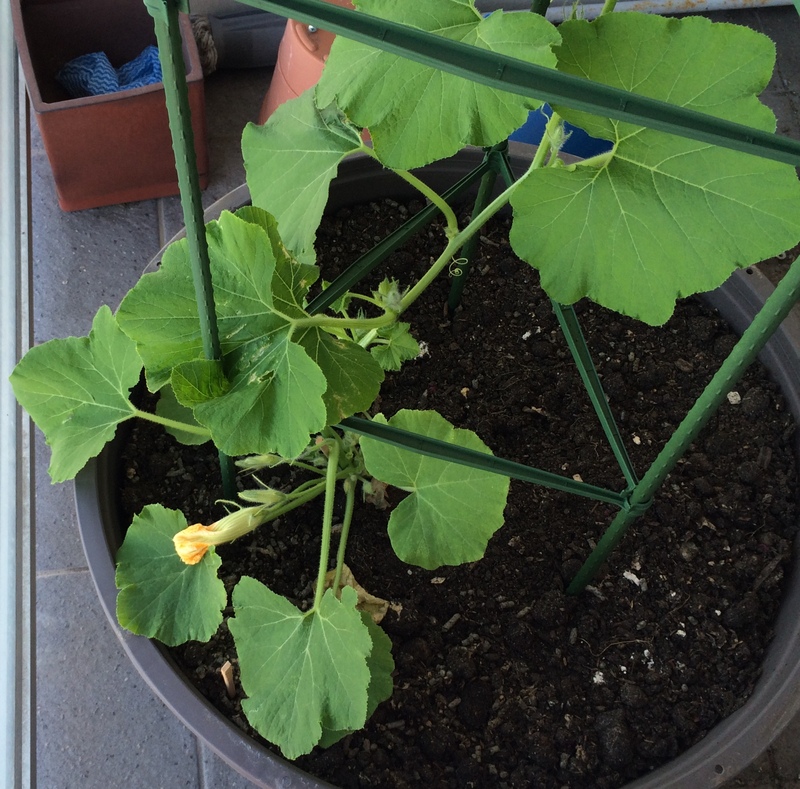 I know it hasn’t been long since my last gardening update, but something happened today that I felt necessitated another update. It’s been hot and humid in Sydney these last few days, we’ve had a bad heatwave. So, I’ve been pretty diligent in turning and watering the compost to keep it cool and and ensure that the food breaks down quickly. This morning, however, the compost bin was steaming. Literally. Steaming. Don’t get me wrong, steaming compost is actually a good thing, because it means that the reaction for breaking down the food into soil is happening at a fast rate. However, I’m also acutely aware that compost piles sometimes spontaneously combust, so I decided to cool it down. Better safe than sorry. I opened the top to vent out the steam and when I thought the compost had cooled sufficiently, I closed it and turned the handle. 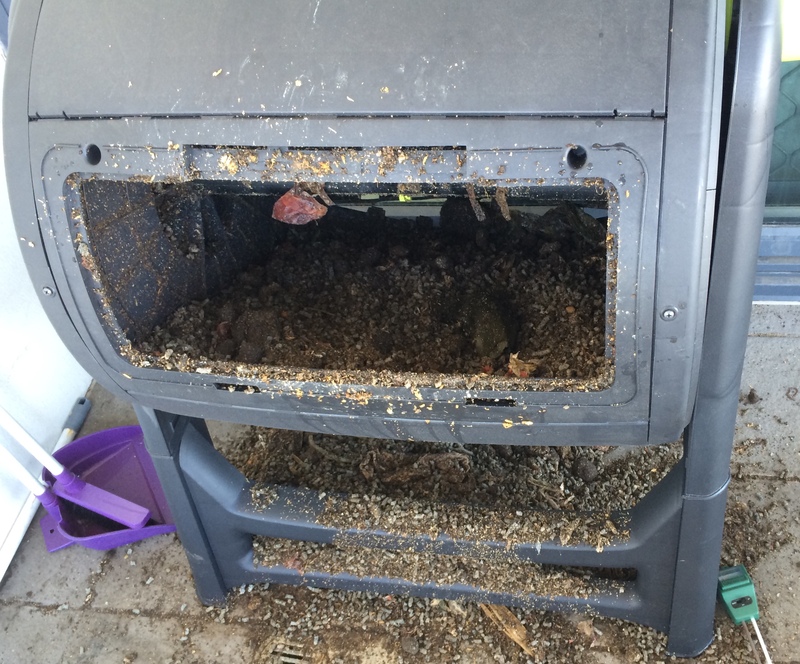 And then…The compost bin exploded. The exploded bin, photograph taken from the hole made by the flying lid. Literally, it exploded. The lid blew off the bin and hit me in the chest, which made me double over in pain. As I bent over, I realised that about 50 litres of hot, steaming compost was pouring out of the bin, most of it on my head. And I just had my hair treated at the salon yesterday! AAAAUGH! After my delicious poop shower, I noticed that most of the compost was still in the bin, so I decided to replace the lid and continue on with the turning. Unfortunately, I didn’t notice that the explosion had torn a giant hole in the back of the compost bin. So, as I turned the crank, the remaining 150 litres of compost got unceremoniously dumped out the hole and onto the balcony. The mess that I have to clean up. Joy. Photo taken after 2 hours of continuous cleaning. This was much much worse before. It took me the better part of the last two mornings to to move most of the compost into one of my bigger pots (the one reserved for root vegetables) and three actual showers before I started smelling remotely human again. 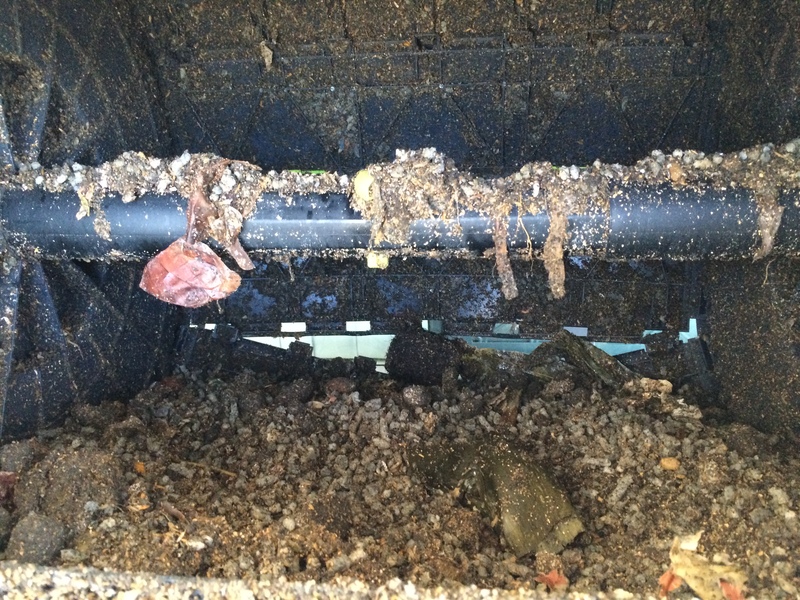 My balcony still smells like a sewer and the exposed compost is attracting flies from all of New South Wales. I guess I’m going to have to invest in another Penny Dreadful. I called Bunnings Warehouse about getting a replacement bin since this one was still under warranty, but they weren’t very helpful about it. Maze, the distributors of the compost bin, have been absolute dolls throughout the whole process. I’d called them after my second bath and they were very apologetic. They’re even sending me one of their other compost bins for free! The new one doesn’t make as much compost as the Keter bin and I’ll have to go back to manually turning the thing again, but, if it’s a choice between manually turning the compost bin and having a bin that explodes, I think I’ll go with the manual turning. Well, at least the punkin has an actual update. It’s got a flower now!